Enjoy the affordable price and features of the Jericho model, plus supportive chair arms with our Jericho Arm Chair. 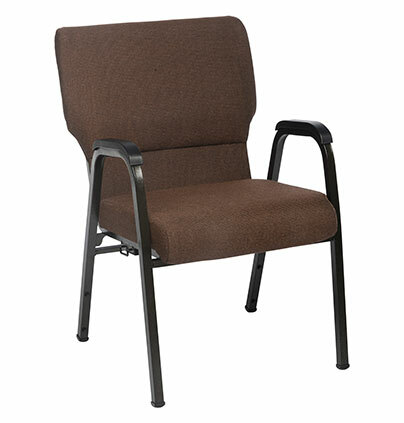 Church chairs with arms offer extra comfort for your congregation. The Jericho Arm Chair is part of our Best Value series, so you know you’re getting a quality chair at an affordable price. These chairs come with all of our signature features, like virgin foam and 16-gauge steel. Chair arms are a popular feature among many congregations. They provide a place for worshippers to rest their arms and enhance the overall seating experience. The Jericho is also available as a standard Pew Chair with or without an enclosed back. View full product features below. Cold rolled 1010, 16-gauge 1” steel frame supports 1700 lbs. 9/16 inch cross bars, 1 inch weld lines, and mandrel bends. ½” CARB 2 Certified industrial grade plywood foundation and seatback. Stronger and stiffer than particle board, strand board, or imitation plywood. MoistureBarrier™ treatment on fabrics to protect against stains. Chair fabrics in compliance with JIS 112, The Oeko-Tex 100 and American Textile Restricted Substances List regarding formaldehyde emissions. 3″ dual density virgin commercial grade foam. Seat cushion with plush rolled front for roomy comfort and leg support. Looking for information on measurements and dimensions? View the product spec sheet for our Jericho church chair.